In a past post about a new educational model Massive Open Online Courses (MOOCs). It seems that more and more well know universities are offering MOOCs. Allowing anyone to have access to some of the best professors in their fields for free. This movement has started to cause people to examine the question of what should the cost of higher education really be? The question is being raised often enough that a post on the HBR blog has started to address it. The biggest challenge is getting employers to understand the value of the MOOCs. They still don’t know what to think about them. According to a recent Financial Times article, many employers are unsure of what to make of MOOC education — unsurprising, since many new technologies and business models go through multiple evolutions. The good news, according to the article, is that 80% of respondents surveyed would accept MOOC-like education for their internal employee development. We can extrapolate from this survey that the employer demand for online education exists — and, moreover, that it is only a matter of time until universities and well-funded venture capitalists will respond to this white space in the market very soon. Employers find it great for already hired and in the workforce people but what about using the system to get a college degree? Would it be totally free? Georgia Tech, in fact, has already responded; in January, it will begin offering a master’s degree in computer science, delivered through MOOCs, for $6,600. The courses that lead to the degree are available for free to anyone through Udacity, but students admitted to the degree program (and paying the fee) would receive extra services like tutoring and office hours, as well as proctored exams. In the near future, higher education will cost nothing and will be available to anyone in the world. Degrees may not be free, but the cost of getting some core education will be. All a student needs is a computing device and internet access. Official credentialing from an on-ground university may cost more; in early 2012, MIT’s MOOC, MITx, started to offer online courses with credentials, for “a small fee” available for successful students — and we’re eager to see how Georgia Tech’s MOOC degree will transform the education model. This seems reasonable to me. You can take the courses for free, but to get the degree or access to office hours, tutoring and other services you pay a fee. So now the student has the power to decide whether they pay for the learning or not. The next step is to make a database that shows the student took the class and completed it. Nothing more. Then a person could list it on their resume and employers have a way to validate the person actually did it. Maybe universities can change to have access to the database? I find the MOOC system very intriguing. As someone who has two elementary school aged kids, I am very interested in how the educational system will start to transform over the next decade and how employers will except the changes. The number one tenet of Lean is listening to your customers. The company should derive what is of value for the customers from the customers. Let Your Customers Streamline Your Business, posted by Lisa Bodell, discusses this very topic in detail. The blog talks about simplifying products and services to help retain customers and increase customer satisfaction. This simplification isn’t necessarily “dumbing” down the product or service. It is about eliminating the waste in the product/service. The first part of the definition of waste is the customer is willing to pay for and finds value in the feature. If they don’t find value then it is non-value added waste. The only way to understand what the customer believes is of value is to engage the customer. Listen to your critics. Does your organization ask for customers’ feedback about what it was like to do business with you? What about asking non-customers why they don’t do business with you? Roast your products and services. Comedy Central gained attention from its famous Roasts, where a celebrity gets torn to shreds with hilarious insults doled out by the audience. Try out this practice on your company’s products or services. Turn pains into gains. Think about actively asking your customers about their pain points when it comes to working with your organization and its products or services. Figure out what your customers do all day. Think you know your target market? Not just their demographic, but what their life is actually like. Learn from other industries. Sometimes businesspeople think their company has unique circumstances; that problem-solving strategies that have proven successful in other industries wouldn’t work for them. This could not be further from the truth. While there is a lot of traditional business thinking that I completely disagree with on the HBR blog, this one is dead on. The best way to increase adoption of your product/service and gain customer loyalty is to listen to the very customers that are you targeting. Judging by ratings, more people watch the NFL and College Football than motorsports. That’s kind of important if I want to come up with something other than the tried and true pit crew metaphor. Chances are if you’ve watched a game over the past few years, the talking heads in the booth have spent some of their time talking about “hurry up” or “blur” or some other variance of a no-huddle offense that is the greatest thing since the forward pass. This is likely to be a huge topic of conversation early in the NFL season as one of the most well known practitioners, Chip Kelly, has left the University of Oregon and is now performing some degree of his voodoo for the Eagles. What does that have to do with Lean and changeovers? Hopefully I can show you. Are there any other good parallels that are in use to talk about SMED or another Lean concept? In the interest of space, I’ve condensed some of the “how” out of this post. If you’re interested, post a comment or drop me a line (joewilsonlean at gmail dot com) and we can discuss this concept or your other examples further. On a recent project, some senior leaders were asking for an update on the development of an app the team was building. The team is using the Agile methodology, so there is progress and changes every day or two to the app. Instead of trying to explain the progress, the team invited the senior leaders to the work space for a demo. The demo went incredibly. As soon as they saw the app, there was great understanding of how it worked. Everyone was able to see not only the customer interaction, but also the aesthetics of the app. The senior leaders asked some really great questions about the customer experience and how the app worked. Because the team is using the Agile methodology, they were able to quickly add the changes to the app for a better customer experience. If you want to understand something, go and see it. It seems so simple. Yet, that is not the first instinct of most. By the team asking the senior leaders to come and see, they are setting an example of this behavior. Hopefully, the senior leaders left with a sense that it was great they saw the app and the work environment and next time they have questions they just go and see. Then it starts to carryover to other projects. Slowly, the behavior starts to change because the benefits are seen. Next time someone asks you for an update, take them to the work and show them. Help change the behavior. Here is another example of quick easy visual management. This is a soap mold from my wife’s business. A couple of the spots in the mold have cracked and now they are not usable. 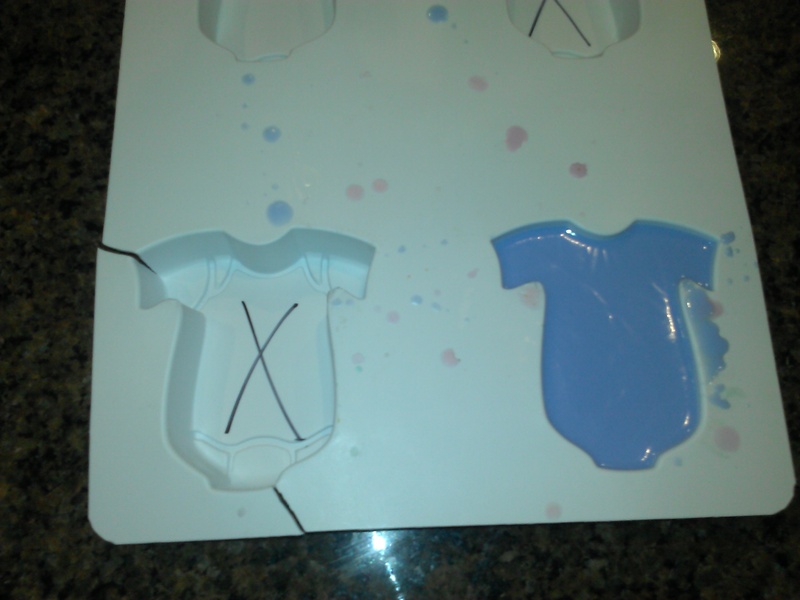 She put a quick ‘X’ on the bottom of the mold so when she is pouring she knows she can’t use that cavity. Visual management doesn’t have to be high tech or fancy. It just has to convey the message quickly and at a glance. In this case, the cavity is usable or it is not. Share examples of how you have used visual management at work or at home.